There are 7 different notes in the scale. When the scale is played, the first note is usually repeated at the end, one octave higher. In this case, that’s the note Db. This kind of “rounds off” the scale, and makes it sound complete. Therefore, the final Db will sometimes be included in examples and diagrams, depending on the situation. The D flat major scale contains 5 flats: Db, Eb, Gb, Ab, and Bb. The scale of a piece of music is usually indicated by a key signature, a symbol that flattens or sharpens specific lines or spaces on the staff. Instead of putting a flat symbol next to every single D, E, G, A, and B, it’s much easier to just place a key signature at the beginning of the music, which automatically flattens every one of these notes. It is an excellent skill to be able to quickly and easily visualize scales on the piano. The key to doing this is focusing on which white keys and which black keys are part of the scale. Also, we have to keep in mind the two zones that make up each octave register on the keyboard. The lower tetrachord of Db major is made up of the notes Db, Eb, F, and Gb. The upper tetrachord is made up of the notes Ab, Bb, C, and Db. What scale degree is the note Gb in the Db major scale? Which note is the 7th scale degree of the Db major scale? How many sharps/flats are there in the key of Db major? How many different black keys are part of the Db major scale? What is the solfege syllable for the note Bb in the Db major scale? Is the note Ab part of the lower or upper tetrachord of a Db major scale? How much distance is there between the two tetrachords that make up a major scale? Which note is the supertonic scale degree in a Db major scale? 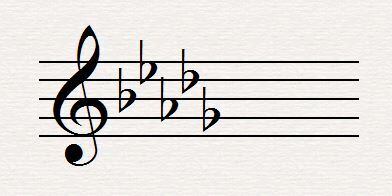 What is the traditional scale degree name for the note Bb in the a Db major scale?